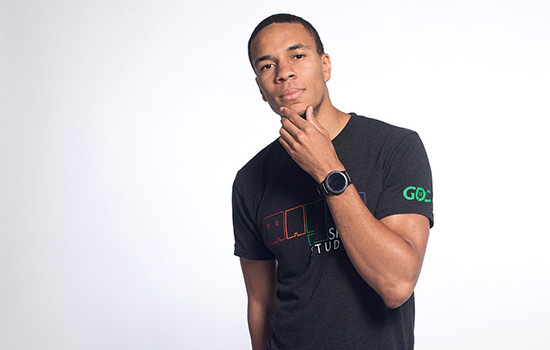 Game design and development major Barrington Campbell worked with other students to create the mobile game MetroGnome. Barrington Campbell loved playing video games as a child, but he didn’t think there would be a future as a professional in the game design industry. “I was wrong,” said Campbell, a third-year game design and development major from Montclair, N.J. In his early high school days, Campbell tried his hand at making games and realized in his junior year that it was time to choose a path. His uncle encouraged him to study game development in college. At RIT, Campbell worked closely with other students and the MAGIC Spell Studios team to create MetroGnome, a rhythm-based mobile game that allows users to listen to their favorite music while participating in action-packed, digital adventures. Earlier in 2018, MetroGnome was selected to represent RIT at the annual Intel University Games Showcase at the Game Developers Conference in San Francisco. MAGIC Spell Studios sponsors promising students so they can attend the conference, which is the world’s largest professional game industry event of the year. Students like Campbell are able to make essential connections with those in the industry, sharpen their presentation and interviewing skills early in their careers and serve as ambassadors for RIT. Campbell has experience as a technical artist on several projects, working on 3D models, graphics and optimizations. But for now his focus is on low-level game engine development with the hope of one day working full time for a top-tier game design studio.